Historical fiction is a tough genre to tackle. When done well, it requires as much research as a biography and the imagination to weave a story that takes the reader into each of the settings. 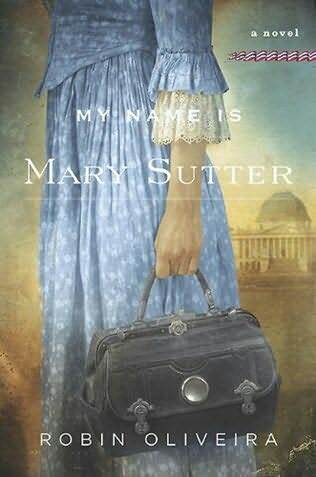 It is clear that first-time author ROBIN OLIVEIRA must have uncovered dozens of unsung heroes and broken hearts while gathering details for MY NAME IS MARY SUTTER. She pieced together a vivid novel. Smart and stubborn, Mary Sutter is continuing the family tradition of midwifery — but only until she can enroll in medical school and study to become a surgeon. Her letters of inquiry are ignored, so she begins her campaign door-to-door, looking fro a doctor who will allow her to apprentice. Her efforts seem to be in vain, until Confederate forces fire on Fort Sumter. Suddenly, there is great need for nurses and doctors in Washington DC hospitals. President Lincoln appoints Ms. Dorothea Dix to be in charge of the medical services for the Union, who also denies Mary entrance to the corps of caregivers. Frustrated, she leaves her menial job at the hellish Union Hotel Hospital and follows troops into battle. There she is faced with character-defining decisions about how best to care for dying men in a hopeless situation. The book also follows, in epistolary form, the difficulties of Mary mother, now a widow living in Albany, as she worries for her children who have all been affected by the war. Sister Jenny is expecting a child, whose father is fighting in a Union regiment. Her brother, too, is serving his country. Though she knows her mother needs the help delivering her own grandchild, Mary is hesitant to leave behind the suffering men in uniform. Oliveira’s strength lies in her descriptive language, especially of setting. Mary Sutter travels a great deal, and the reader can easily envision these now large cities as the muddy, barely habitable towns they were in the 1860s. Her anatomical descriptions are not for the squeamish either. Difficult child birth and limb amputations are not glossed over. The storyline at times can be a little uneven, and feel somewhat like Dr. Quinn, Medicine Woman. Still Oliveira’s writing style remains strong throughout. Thank you to Yen for the advance copy of this book.